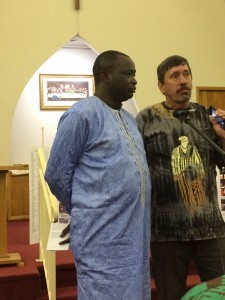 We have been blessed to host Markus Gamache as he hosted us when visited in Nigeria. One body in Christ, across the ocean… we have seen and heard each other’s journey and we have been blessed. It was a busy two weeks, we traveled over 2000 miles and spoke in 10 different venues from churches to Colleges. It was a real treat to be able to hear and watch Markus interact with different audiences across the country. He has a way of connecting with those he is speaking to and can bring an update of the true happenings in Nigeria to a very personal level. Here are a few highlights about Markus and our journey with him. Each time I listened to Markus speak to a group or held a conversation in the car I learned a little bit more of his story. Markus was born into a pagan family. He was the first boy born to his mother, who was the fourth wife of his father. He grew up in the bush where each wife had three huts, one for sleeping, one for cooking and one for storing corn and making beer. The father had a hut to himself in the center of the compound. Markus grew up with many brothers and sisters. When he was about 7 years old to 10 years old he began going to school where he learned to read the Koran and was learning the Muslim prayers. His father was a leader in the community and became a Muslim and so his whole family became Muslim. This was when Markus was 13 years old. Between the age of 10 and 13 Markus and the other boys in his school met a Christian man who told them it would be very difficult to become a Muslim; because if you did not recite the prayers just right they would burn you with a hot poker stick. Markus decided to become a Christian out of this fear. When his father decided the family would become Muslim, Markus was kicked out of the house and built a small corn stalk house at the edge of the village. His mother lived with him until he was 15 years old, when his father required her to return home. She continued to support him with food placed over the fence. Currently Markus’ father is deceased and his mother is living in his home as a Muslim. He has many Muslim friends and family members as well as Christian friends and family members. Markus has been working with interfaith relations for years. He has six children, two with his first wife who died of complications of diabetes when the children were 7 and 8 years old. He then married his current wife Janada and they have four children ages 7, 5, 3 and 6 months old. Markus works with the EYN church and is the representative from EYN to the Church of the Brethren, USA. This requires much time and energy away from his family. He hosts visitors to Nigeria, making many things possible. He visits both in USA and Germany to continue work for the church. During the Crisis since 2014 Markus shared he has not slept in his bed. 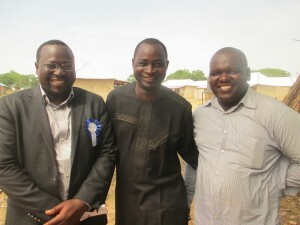 He has hosted many people in his home, both Muslim and Christian, all running for their lives from Boko Haram. He lives in a three bedroom home, with one bathroom. He described hosting over 60 people in his home at one point. Not just of a night or two, but for months. It was a hard burden… to feed these people. Little children were everywhere, sometimes defecating and urinating on the floors. His wife was exhausted and their marriage stressed. So the interfaith camp at Gurku…was born out of necessity. The Church of the Brethren and many others have supported its ministry. Before I get lost in the story of Gurku, let me say that Markus still hosts 20 people in his home and he continues to covet time with his family and his wife. Still giving up his bed for others, he is a servant for sure, with much sacrifice. When our group visited the interfaith camp at Gurku there were 70 families living there, both Muslim and Christians, all displaced by the violence in the Northeast. They had a church building started and were beginning to build a mosque. The people worked together to make their own bricks and helped each other build their homes. They have an infirmary and a brick oven for the widows to bake muffins to sell. Now there are 170 families living at Gurku. The widows have their own living area and a fish pond. They just finished harvesting the fish and smoking them for eating and selling. The church has been completed with windows and doors, and a tile floor. They have also built a guest house at the site. This community is very close to Markus’ heart and in the future he would like to move his family to this community to live and work with them. He often thinks of a day when he can spend his time raising his family. Markus will say that he never planned to build an interfaith camp, but out of the need for a place for all the displaced people the community has been developing with support and leadership from many people. Who are the Boko Haram? I am no expert, but I have learned in the past two weeks that Boko Haram was born out of poverty, lack of resources, food, and they are fellow Nigerians, brothers and cousins and yes relatives to the people we have met in the EYN. Nigeria had been suffering from lack of food and a poor economy since 2009. Somehow Boko Haram has been able to obtain weapons, food and money. They have ways of employing others to work for them and since the economy is so depressed people will agree to work for them before they even know what they signed up for. So indeed Boko Haram includes people in each community that are known by members of EYN; people they have gone to school with, met in the market, and members of their own family. Markus shared his mother was held by the Boko Haram for nine months. He did not know if she was dead or alive. Her own grandson came to her numerous times intending to kill her. And so yes, religious ideology is part of the Boko Haram, but it is also political and economical as well. As I think of the Chibok girls, I am realizing it is a very complicated situation. It leads me to the scripture Markus was sharing and struggling with on this trip. “You shall love your enemies, pray for those that hurt you.” Markus asked us to think about who are our enemies? Can you name them? Did Jesus know what Nigeria was going to go through when he said love your enemies? What should they do when they recognize the man that killed their husband, or slaughtered their baby? What should you do when you face them in the market? Markus and others covet our prayers and our wisdom, inspiration and strength to help them to love their enemies because as human beings it is extremely difficult to forgive and love. I can only suggest that it is the Christ in us that allows us to be able to look upon another person who has harmed us and hurt us so deeply, and to respond with grace, love and forgiveness. It is not us alone that can forgive and love, but the power of Christ in us that gives us the strength to not retaliate. Markus challenged people to give to him the wisdom of how to respond to enemies. He was searching for answers, for strength, for our prayers and support. 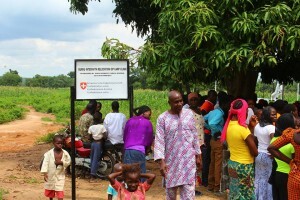 Building the Church in Nigeria through a tractor? Each day of our journey with Markus was filled with moments of deep sharing, wondering and dreaming. It was good. It was exhausting. As we traveled from farm to farm, and drove from Elizabethtown to McPherson College, a dream started to develop in our car. Markus was learning more and more about farming, preparing the soil, tractors. And then we started thinking how would a tractor in Nigeria change the ability of the people to plant more crops. And with each new farm and farmer we met we asked more questions. 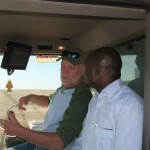 We researched tractors in Nigeria, and a proposal began to take shape. And although it is still only a dream, a possibility, it is exciting to think about building the church in Nigeria with a tractor. We have learned that Nigeria is the third worst country for famine. In the northeast and even in the camps closer to the center of the country the people do not have enough food to eat. People are dying in the camps every week for lack of food. A tractor would be helpful in preparing the soil for planting. Right now all farming is done by hand. In some areas the bush is being tilled for the first time and it is very hard work. If the tractor could disk the ground, the people could plant more crops and harvest more food. They would have more food to eat and to share with their neighbors. They would have seeds to save to plant for the next year. Some of the crops could be sold and the money used to pay for hospital needs, school fees for their children and placed in the church offering. Many people are not going to church because they have nothing to give to the offering. Pastors are not being paid because the people are in crisis and do not have much to give. Over 1600 churches have been burned and destroyed in the northeast. Pastors are out of work. We do not even know where some pastors are located presently, dead or alive. 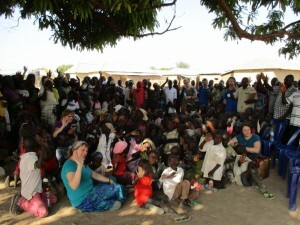 People are settling new areas of Nigeria and the church is growing as host communities join displaced EYN members. If people had more money to give to the church, they could pay their pastors and have money to rebuild the buildings that were destroyed and build new buildings in new communities. They would feel good about being about to support their families and community. Each day I shed tears of compassion for the far reaching effects of crisis. I learned how complicated counties, people, churches, governments and systems can be. How overwhelming the needs. How faithful God’s people are all over the world. I continue to witness the power of prayer, the faithfulness of God’s mercy. 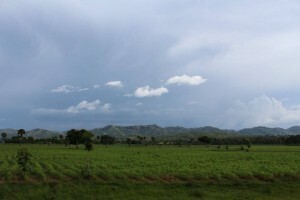 Summer is rainy season in Nigeria. It’s time for planting. $2500 from Church of the Brethren support provided seeds, fertilizer and herbicides. Thanks to an abundant rainfall, the crops are growing nicely. As the new crops grow, food from last years crop tends to run out. 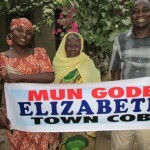 22 families were really suffering and COB funds were able to provide help. Gurku is a long way from a hospital. There is a clinic built by the Swiss Embassy but it is always a struggle to have enough medicines on hand. There have been four deaths (all women) so far this year. Funds have been used for medicines, hospital visits and funerals. Help from Others – Zawram Islamic Global Foundation brought vaccines for hepatitis. 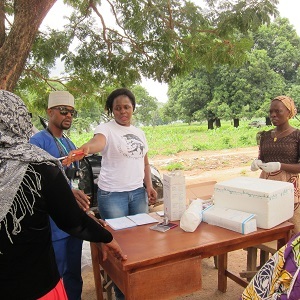 Marie Stopes Nigeria did some medical tests, Voice of Mathias Group brought bicycles, books, Bibles and mats. A Nigerian engineer brought food items. Continued Challenges 1) Cost of medical help 2) Distant relatives who have heard of the camp ask for monetary assistance. 3) More homes are needed to house the numerous families still without a place to live. 4) More kitchens need to be built. 5) Classrooms for the over 200 pupils 6) Families continue to hear of attacks on relatives in the Madagali and Gwoza area.